We first fell in love with Jennifer Behr‘s dinosaur headbands after seeing them on the runway at Fendi. 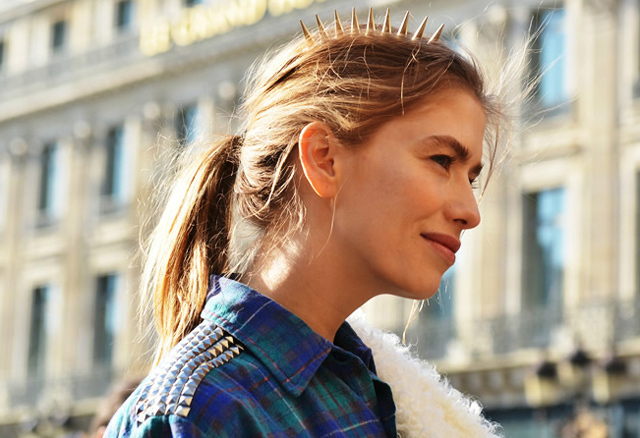 Then, we crushed hard on this Maison Michel metal spiked hair comb spotted on Elena Perminova in Paris. Perhaps we can blame our attraction on our stegosaurus obsession (yes, this is true). Or it could simply be because these spiked hair accessories are so badass and bananas (also true). Either way, a DIY was definitely in order. Glue another spike to the other end of the comb. 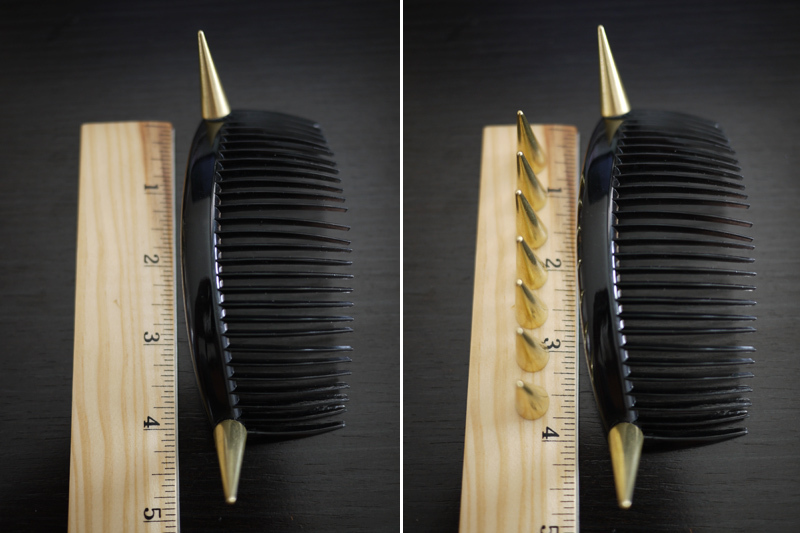 Then, using a ruler, place the rest of the spikes along the length of the comb to make sure there is enough spacing between each spike. Continue glueing each spike, alternating from one side to another. 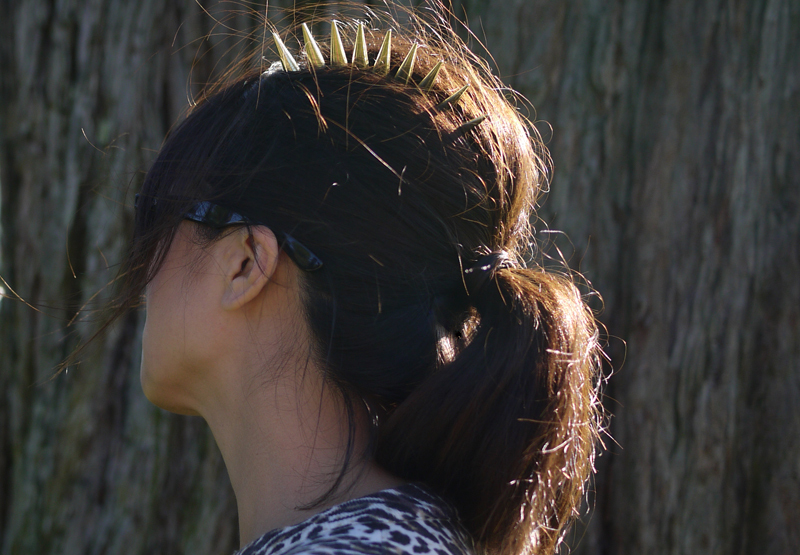 Stick the spiked comb in a bed of teased and tousled hair! What an interesting DIY- I would have never thought of bringing that runway look into real life. Intriguing. Should I look for spikes today? Very cool! I loved the DIY quite easy and different! Hello genius. I love this. And it’s funny because I was just at the museum of natural history yesterday admiring all the dinosaur bones, I totally hear you on the stegosaurus thing. wow this is a fabulous idea. I’ll definitely be doing this. Amazing! I can’t wait to do this! so edgy, defs wanna try this!!!! very interesting – and original! Love this! I will be making these soon. :o) Thank you for sharing. OMG its so easy to to do! Honestly, where did you source the spikes? @Style Dilettante, links are in the post under YOU’LL NEED (highlighted in blue). good luck! This is BRILLIANT and AMAZING!! LOVE the edgy look! Studs and spikes are one of my faves! So cool, I’ve wanted one of these since seeing that pic of Elena Perminova. Such a simple diy too! Woah thats insane!! those spikes would be cool on a headband too, Lady Liberty style. And thanks so much for picking me as DIY winner for the Foam contest, so exciting!!! i will totally make this !! such a cool diy!! running to the store asap. thanks for sharing! so down!!! absolutely making this amazing DIY thank you so much! Such a cool DIY! Looks amazing. This must be the only missing piece in my spike-collection, love it! Thx so much, I’m already looking for the right studs as I speek .. 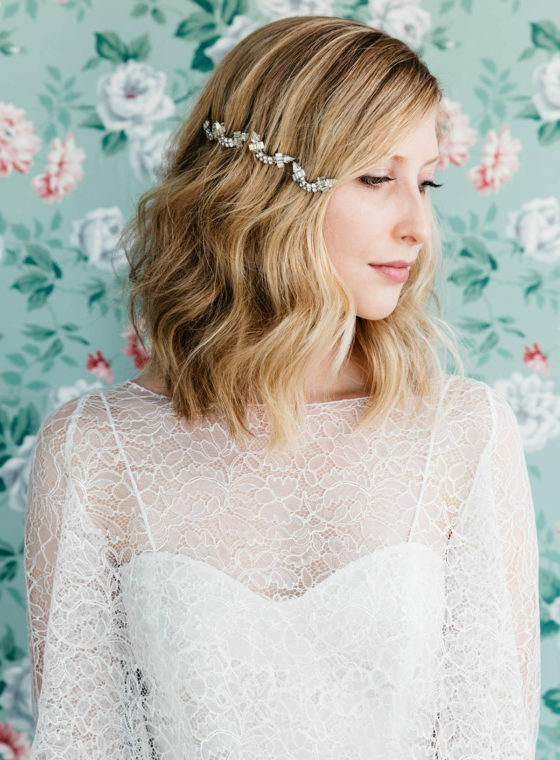 This tops the DIY’s.. Quite possibly one of my favs…. OMG, i love it! 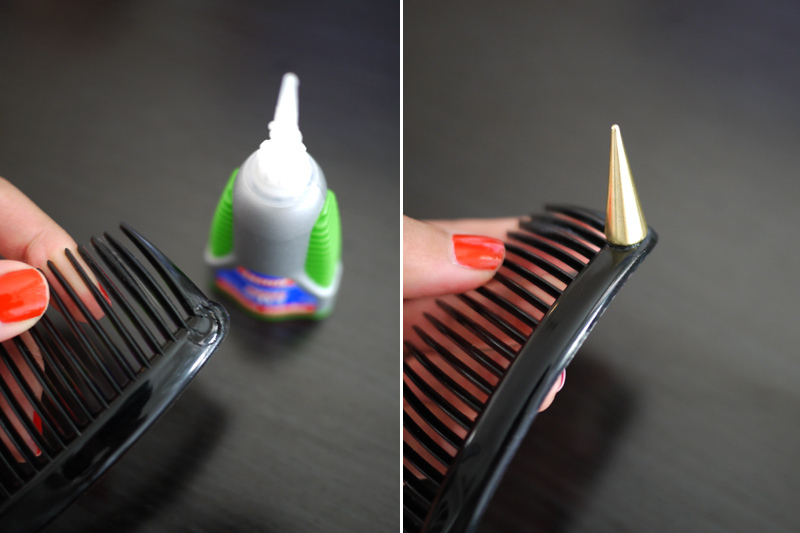 im so into spikes and anything really edgy right now.. this is a perfect little DIY i can do before i go to uni! wiiii, love that! 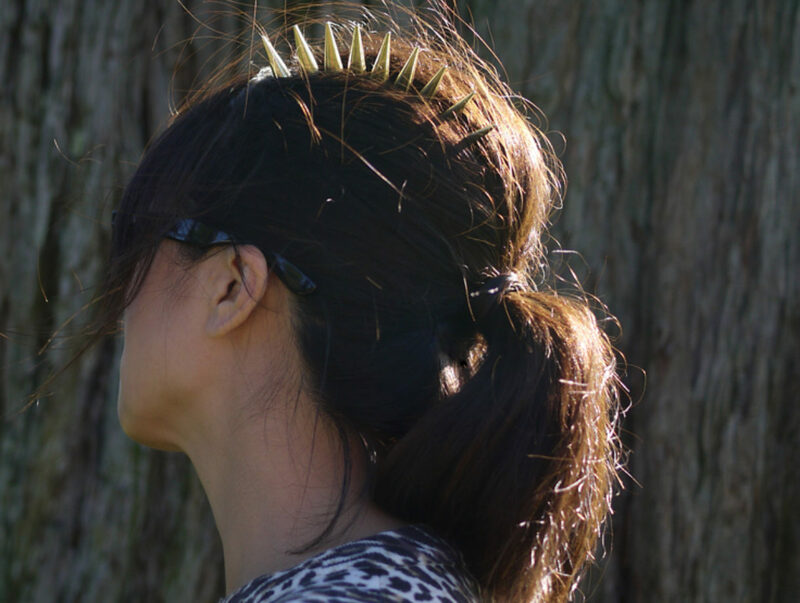 guess it’s not for me (at least not with that kind of spikes, but some smaller/gentler would work well), but the idea is so so simple and cool. thx for sharing! This is quite a bit different from the feathered fascinators and combs that you typically see. Less grandma and more rock & roll. Wow! Amazing…. wondering where I’ll be able to find the spikes in the UK…. any ideas anyone? Shall have to have a hunt! This would be good to do for Christmas with one spike on the comb, dressed up as a mini Santa hat! I love this DIY alot! I looked everywhere in my town to find some spikes, but unsuccesful! 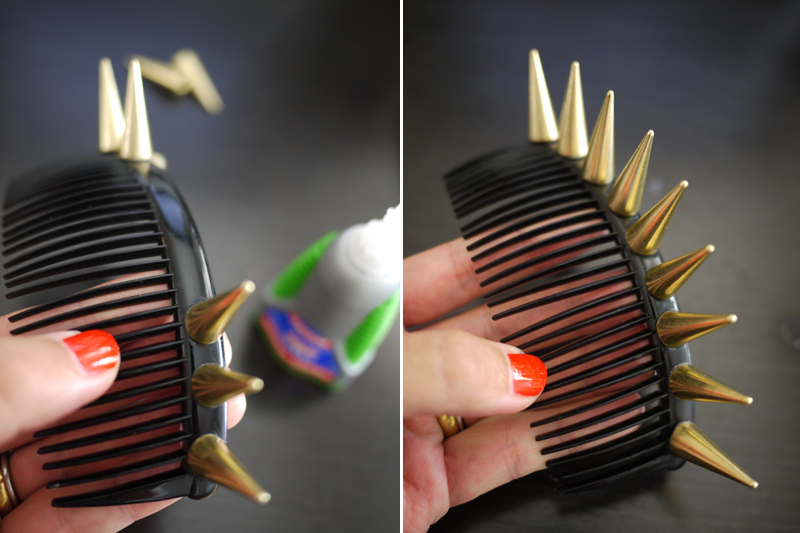 but I’ll definitely keep this DIY in the back of my head in case I stumble across some spikes. Where do you get these spikes? I’ve been to 5 different craft stores. I need them! Aw, I wish I had found this sooner!! My friend was a dinosaur for Halloween and she could’ve used this!!! Question, i really love this idea, tried it out n the spikes don’t stay. They seem glued good, but with a little pressure they peel right off. Any ideas? Megs – I had the same problem. I found Epoxy Putty (I chose a version meant for metal), and that works GREAT. It’s a tube of stuff that looks like clay – you cut a slice off (like frozen cookie dough), mash it well between your fingers to mix the inside core with the outside stuff, and then press a small ball of it between the spike and the comb. It sets QUICK, so you’ll need to hold it for only a minute or two. 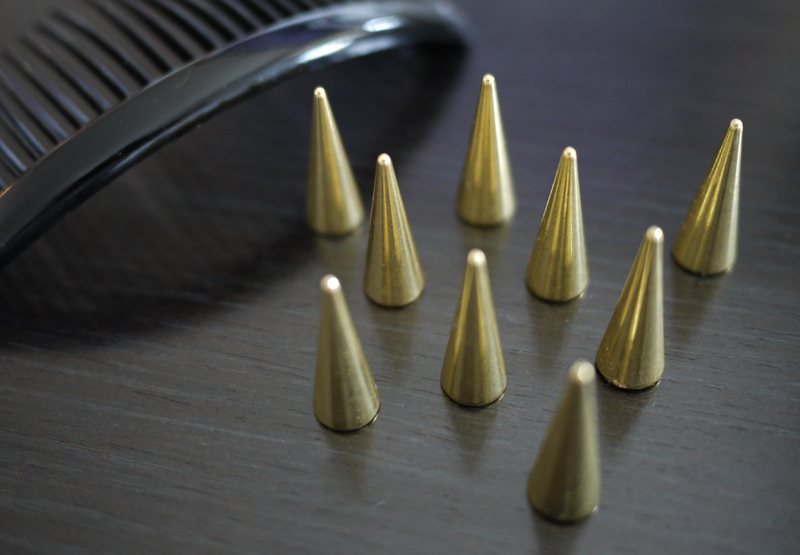 BTW – this method works on both the gold and the silver colored spikes from the website. Have fun! where can i buy these spikes??? ?